After my short Friday stay in Boston I was able to catch a ride with Chelsea to Providence, Rhode Island where I planned on taking a short train ride down to Kingston, but due to the lovely snow, the train was delayed two hours, making my wait time longer than the trip itself! When I finally made it down to the southern part of the state I was warmly greeted by Jonathan and Elizaveta Friesem, who I lived with while working for the Harrington School of Communication and Media and the Media Education Lab from 2012-2013. We reminisced on cherished times together and excitedly spoke about upcoming events this summer, including the NAMLE 2015 Conference and the Digital Literacy Summer Institute. Although I was not able to meet with Renee Hobbs this time since she was busy traveling, I do hope to see her this upcoming summer. On Monday Jonathan took me to Narragansett Elementary School to see the progress Susan Sabella has made with her colleagues on promoting media and digital literacy in the classroom. A group of teachers has been attending the Digital Literacy Summer Institute and I was happy to see this summer’s event on their school wide calendar in the office. While at the school I met with the principal, Gail Dandurand and sat in on a meeting with the art teacher Krysten Bryce, who was brainstorming ways to use Twitter to further her practice and inform parents of classroom happenings. The day’s visit ended with a bang when I got to tour the library that Brien Jennings, the library media specialist transformed into an open, collaborative youth space that includes a recording room with a green screen. Student-driven learning was most definitely in-action and Brien easily moved from group to group offering assistance where needed. 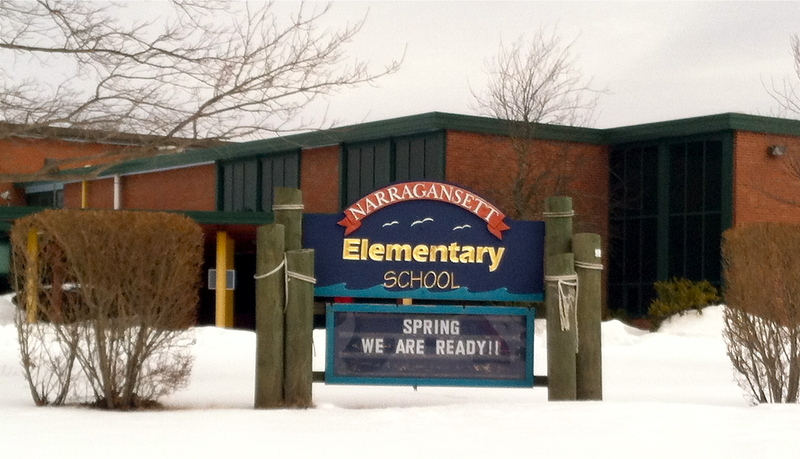 As we left the school we laughed as we saw the sign out front declaring Narragansett has had enough of this winter! To combat the weary weather I decided to spice things up and try anti-gravity yoga with my friend Heather. Contrary to what one may first think when yoga comes to mind, this was no tranquil practice! I felt like I was training to become an aerialist as I flipped in and out of a swinging white sheet. *The next part of this blog post (coming tomorrow) will cover my crazy time in NYC!